At Aycliffe Drive Primary School, we recognise the importance of Early Years education in providing the essential foundation for all future learning. We acknowledge that play is a powerful medium for learning and that in the Early Years children learn best through well planned play both indoors and outdoors mixed with the start of formal learning, which will result in them learning with enjoyment and challenge. All these areas are promoted through use of both indoor and outdoor classrooms as highlighted in the planning. Whenever possible, as well as teacher led activities, when appropriate, children’s learning will be through first hand experience and/ or structured play activities with plenty of opportunities for children to talk about what they discover and what they are being taught. Wall bars, Gymnastics, small games apparatus and the playground climbing equipment are all used. There is currently an after school dance club on offer to our pupils. Phonological awareness is taught in a structured way using the Jolly Phonics method and the’ Letters and Sounds’ document. Children learn how to hear, identify and write letter sounds as well as beginning to blend and segment sounds for reading and spelling using kinaesthetic skills to enhance learning. The children are encouraged and supported in developing the knowledge, skills and understanding that help them to make sense of the world. 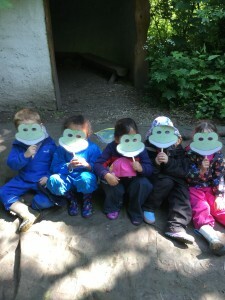 They are given opportunities to use a range of tools safely; encounter creatures, plants, people and objects in their natural environments and in real life situations; undertake practical experiments and work with a range of materials. This area has 3 strands: People and Communities, The World and Technology. Learning within these areas links to Science, Geography, History, RE and ICT.